Ram 1500. Do not remember the criteria but do remember the results. RAM. They went on to talk about the vehicle without specifics on the engines. Then they talked quite a bit about this being the last year for the Ram 2500 manual transmission. Now there is only one pickup manual and I think it's a Colorado 4 cylinder basic model. TwoBobs, SlowrTrfcKeepRght and mitchmaclean like this. Didn't you know that Chevy is the most awarded "car company"? HAHA. Kinda like a third world dictator's chest full of medals. Ram was the only truck that made me grin when I drove it. Of course those GM trucks with the square wheel wells and 1 running light out, make me chuckle. Anybody notice how many GMs have a light out? mitchmaclean and btrotter88 like this. Not as many as my vibrating BSA and Harley motorcycles. Bulb life for them is measured in hours. Maybe the Chevy has good vibes? Virtually all of the car magazines and rating folks have said the Ram is by far the best of the current lineup of pickups. Some speak of overall, some speak of interior design for both low and high trim models and some speak of high trim models. 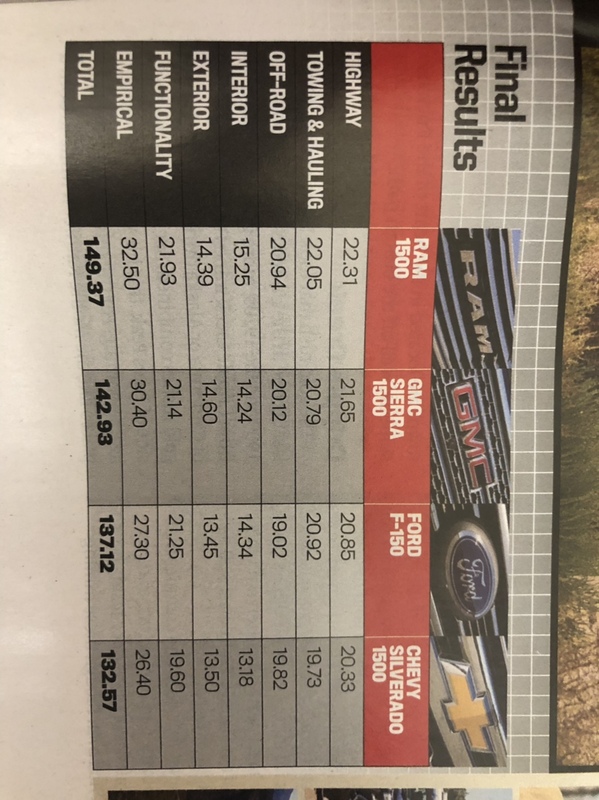 While I know it is of no interest of you the last couple I read noted how far ahead the Longhorn or Limited trim Ram is compared to the best of Ford or Chevy. Then yesterday while sneaking a peek at a magazine on the rack at a local supermarket, "Ram Rated Best". Can't remember the name of the magazine but something like Truck and Driver or ??? Ram 1500 had the most positive points with GM vehicles, Ford and the foreign ones below. Two different opinions both the same. Seems to me, if your brand didn't win a "Best" award, just go grab another magazine. And really all that means is that it is of the opinion of the author anyways. I find my taste seldom matches up with these magazine authors. I drove a Ram Limited. Absolutely hated the leather seat. Didn't fit my body. My young kids even noted they didn't like the back seat either. I love the "high end" cloth seat in my Outdoorsman. Try finding a Limited without leather seats. I test drove an LTZ 1500 last week. Couldn't find anything I didn't love about the truck. Leather seat felt great. I guess maybe the heated seat wasn't as warm as the seat I have now. No biggie. Just interesting that two evaluations in a row the past week or so were for Ram as the best. Sure they are subjective based on on some objective categories. That may seem silly but how do you objectively evaluate the comfort of a seat. People like me are happy to just get any kind of seat. I would be uncomfortable if it were leather as I would not want to ruin the darn thing by sitting in it. Then later I might find out I had a screwdriver in my pocket and must not pay hundreds to replace the major tear I put in. Would detract points for leather, air bags, navigation, big screens, fancy lighting and loud tires. All unnecessary to me but a high priority to some. Evaluations will be in large part a subjective opinion of the author. Things like fuel mileage, towing weights and dimensions are objective and can be more easily evaluated. You just have to be smart enough to know that these evaluations are both objective and subjective. I think they make a good reference for potential buyers. Lol that article discredits itself to me how the hell are gm and Chevy that far apart, they are the same damn truck!